We know that by this point in the development of CNC technology, nothing should amaze us. We’ve seen CNC machines perform feats of precision that shouldn’t be possible, whether it be milling a complex jet engine turbine blade or just squirting out hot plastic. But you’ve just got to watch this PCB milling CNC machine go through its paces! The machine is from an outfit called WEGSTR, based in the Czech Republic. While it appears to be optimized for PCB milling and drilling, the company also shows it milling metals, wood, plastic, and even glass. The first video below shows the machine milling 0.1 mm traces in FR4; the scale of the operation only becomes apparent when a gigantic toothbrush enters the frame to clear away a little swarf. As if that weren’t enough, the machine then cuts traces on the other side of the board; vias created by filling drilled holes with copper rivets and peening them over with a mandrel and a few light hammer taps connect the two sides. Prefer your boards with solder resist and silkscreening? Not a problem, at least judging by the second video, which shows a finished board getting coated with UV-cure resist and then having the machine mill away just the resist on the solder pads. We’re not sure how they deal with variations in board thickness or warping, but they sure have it dialed in. Regardless of how they optimized the process, it’s a pleasure to watch. At about $2,600, these are not cheap machines, but they may make sense for someone needing high-quality boards with rapid turnaround. And who’s to say a DIY machine couldn’t do as good a job? We’ve seen plenty of them before, and covered the pros and cons of etching versus milling too. Sometimes we get tips that only leave us guessing as to how — and sometimes why — a project was built. Such is the case with this PCB printer; in this case, the build specifics are the only thing in question, because it puts out some pretty impressive PCBs. All we have to go on is the video after the break, which despite an exhaustive minutes-long search appears to be the only documentation [Androkavo] did for this build. The captions tell us that the printer is built around the guts from an Epson Stylus Photo 1390 printer. There’s no evidence of that from the outside, as every bit of the printer has been built into a custom enclosure. The paper handling gear has been replaced by an A3-sized heated flatbed, adjustable in the Z-axis to accommodate varying board thicknesses. The bed runs on linear rails that appear custom-made. Under the hood, the ink cartridges have been replaced with outboard ink bottles in any color you want as long as it’s black. The video shows some test prints down to 0.1 mm traces with 0.1 mm pitch — those were a little dodgy, but at a 0.2 mm pitch, the finest traces came out great. The boards were etched in the usual way with great results; we wonder if the printer could be modified to print resist and silkscreens too. [Androkavo] seems to have quite a few interesting projects in his YouTube channel, one of which — this wooden digital clock — we featured recently. We’d love to learn more about this printer build, though. Hopefully [Androkavo] will see this and comment below. 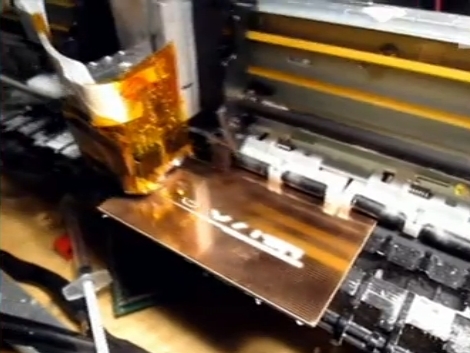 What if there were only two steps for making your own printed circuit board; print, etch? That’s what [Jeff Gough] has been working on and he presented the process in his talk at 27C3. In the first portion of the video after the break [Jeff] talks about various industrial PCB manufacturing processes in a depth you may not have heard before. We found it to be interesting but at about thirty minutes into the clip he begins the presentation of his modified printer. It’s an inkjet that can print wax onto copper clad board. The wax acts as a resist for chemical etchants, and provides very high resolution. He’s using a heavily modified print head, which brings to mind that diy piezo inkjet head which also has wax printing in its future plans. This certainly seems promising and if the process can be simplified it might do away with the toner transfer method. 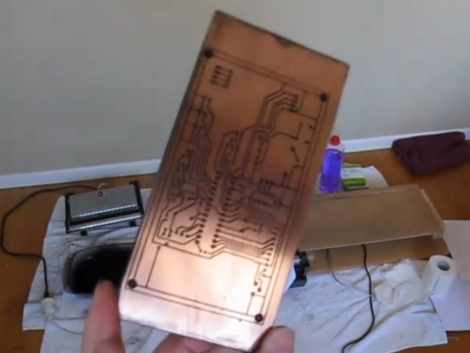 [Rhys Goodwin] has been working on a system to print resist onto copper clad using an inkjet printer. This is a toner transfer alternative as it still uses toner, just not quite as you’d expect. The first step is to modify an inkjet printer, separating the carriage from the feed rollers in order to increase the clearance for the substrate. Instead of printing with etch resistant ink, as we’ve seen before, [Rhys] prints with black ink and then covers the board (ink still wet) in laser toner. Once there’s good adhesion he blows off the excess and bakes the board in a sandwich press, with spacers to keep the iron from touching the surface of the copper clad. This cooks the resist into a hard plastic layer and the board is ready for the acid. Watch him walk you through the process after the break. [Rhys] uses the same method for silk screen, printing in red and baking the ink onto the substrate without added toner. This produces a nice looking board but it’s still quite a bit of work. It certainly sheds more light on the process than that laser-printer method from back in May. We hope you’ve been inspired by this and come up with the next innovation that makes this process easier.